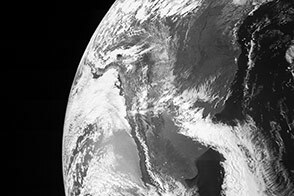 On most days, the Earth Observatory presents our planet in close-up, filling the camera with its oceans and mountain ranges, clouds and rivers. But occasionally, NASA helps us all take a step back to see the big picture of our place in the solar system and universe. Such a view was recently beamed back by NASA’s Mercury Surface, Space Environment, Geochemistry, and Ranging (MESSENGER) spacecraft. 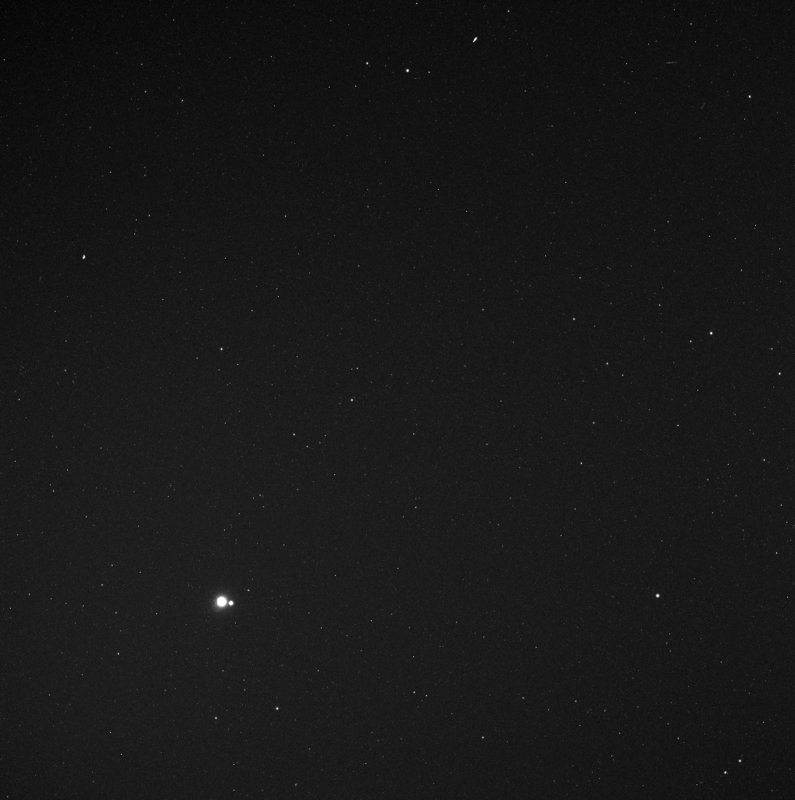 Looking back from its orbit around Mercury, MESSENGER captured this view of Earth and the Moon on May 6, 2010. The spacecraft was 183 million kilometers (114 million miles) from Earth at the time, farther than our average distance from the Sun (150 million kilometers, or 93 million miles) because Mercury and Earth were at different places in their orbits around the Sun. The image was taken by the spacecraft's Wide Angle Camera (WAC) on the Mercury Dual Imaging System (MDIS). The view was a happy coincidence for the MESSENGER science team, as the probe was looking for vulcanoids, small rocky objects that have been postulated to exist in orbits between Mercury and the Sun. From the spacecraft’s view, Earth and the Moon are located near the boundary of the constellations Libra and Scorpius. MESSENGER is the first spacecraft to fly by Mercury since Mariner 10 in 1974-75. It is not, however, the first to get a long-distance shot of Earth. 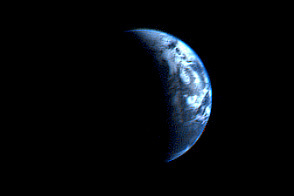 In 2003, the Mars Global Surveyor spied Earth and its Moon in the same frame, while the Spirit Rover on Mars snapped the first shot of our planet as viewed from the surface of another planet. In 2006, Cassini sent back snapshots from 1.5 billion kilometers (930 million miles) from Earth as the spacecraft orbited Saturn. 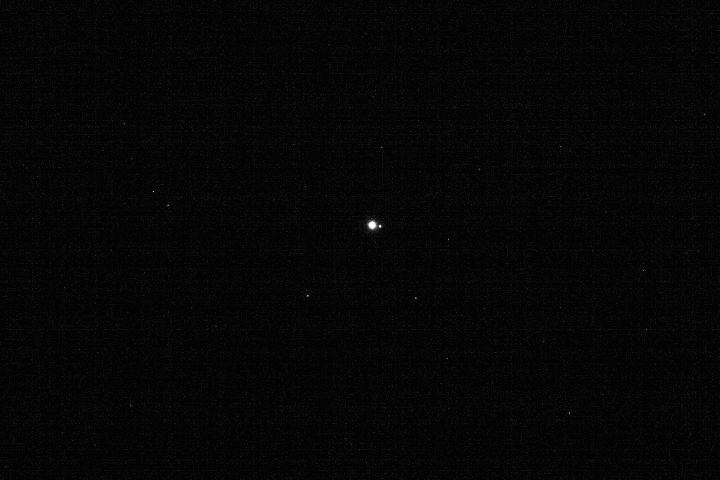 And the operators of the venerable Voyager 1 spacecraft pieced together a family portrait of the entire solar system in 1990, spying Earth from more than 6.4 billion kilometers (4 billion miles) away. NASA image provided by the MESSENGER science team, NASA/Johns Hopkins University Applied Physics Laboratory/Carnegie Institution of Washington. Caption by Mike Carlowicz. 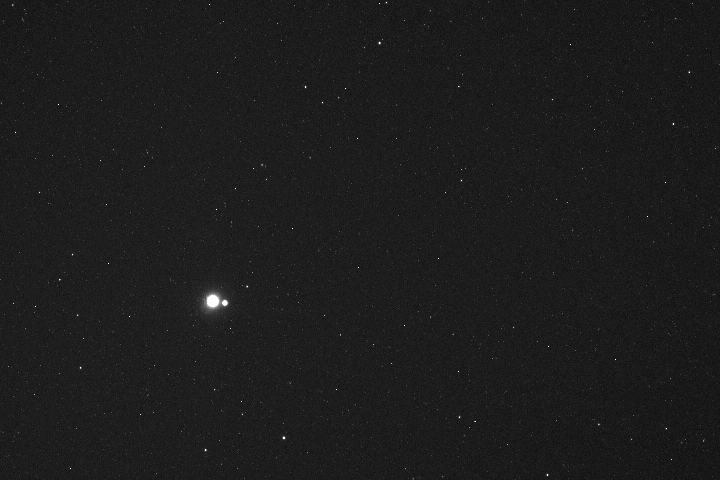 Looking back from its orbit around Mercury, MESSENGER captured this view of Earth and the Moon on May 6, 2010. Johns Hopkins Applied Physics Laboratory. (17 August 2010) MESSENGER Mission Page. Accessed September 8, 2010. NASA JPL. 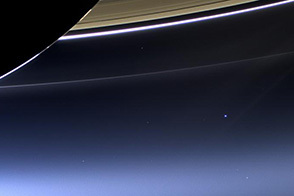 (2 November 2006) Earth: The Lone Pale Blue Dot?. Accessed September 8, 2010. NASA Space Science Data Center. (14 December 2007) Solar System Family. Accessed September 8, 2010.